With St. Patrick’s Day so close to Easter this year I have gotten a head start on some fun St. Patrick Day Dessert Ideas. 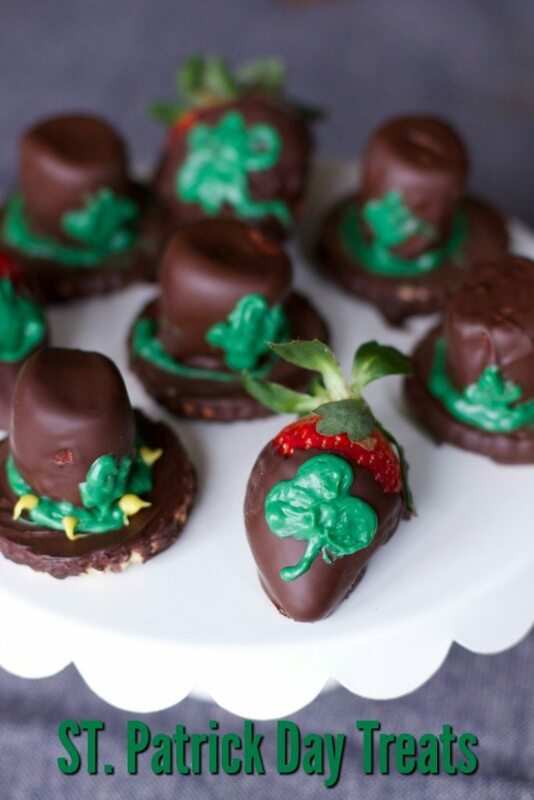 These dessert ideas are all super simple but are the perfect touch for your St. Patrick’s Day celebration. 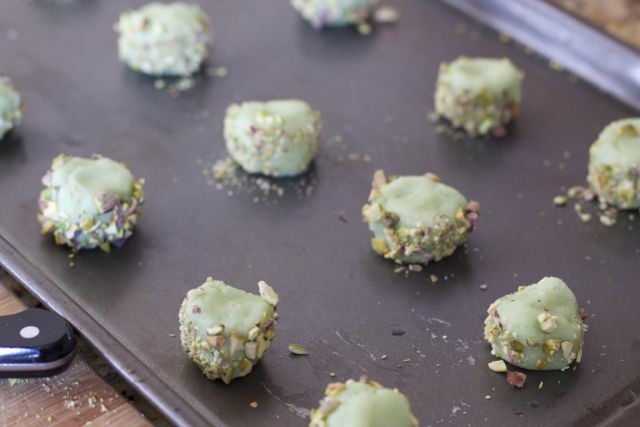 I had featured these Pistachio kisses on Friday Frenzy link up and it has gotten a lot of pins. I took her idea but changed up the recipe a little bit. 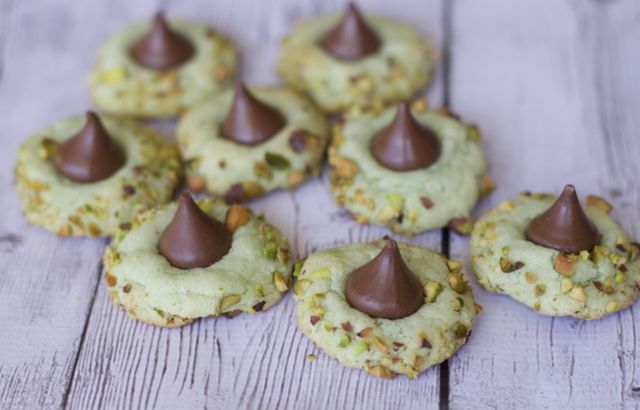 The result is a flavorful and festive dessert, Pistachio Pudding Kiss Cookies. If you don’t like pistachios then this is not the cookie for you. I guess you can substitute the pistachios with pecans but you can still taste the flavor from the pudding. 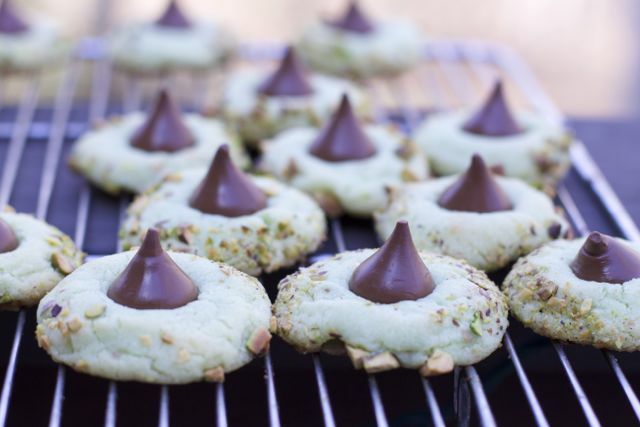 I think the chocolate kisses compliment these cookies and make for a little ST. Patty’s day party in your mouth. 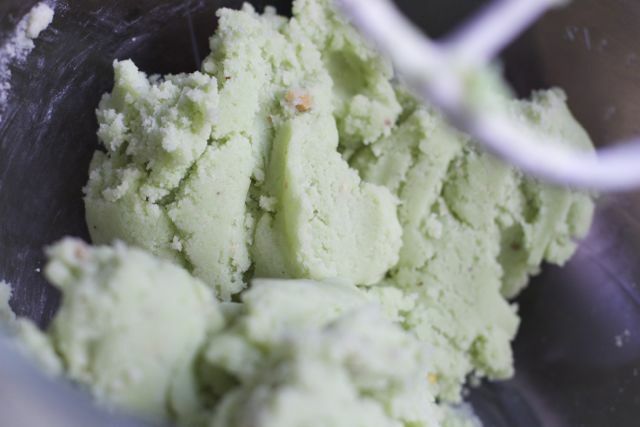 The pudding creates this beautiful green dough for these cookies. Using a small Ice Cream Scoop make these balls of dough that you can roll into your nuts. These ice cream scoops are used a lot in my cooking from meatballs to cookies, this is a purchase well made. No need to coat the cookie pans if they are non stick pans. Once you get them out of the oven attach a chocolate kiss to the cookies and allow them to cool completely. Don’t want to give the kids more chocolate, they were tasty sprinkled with a little green sugar too. 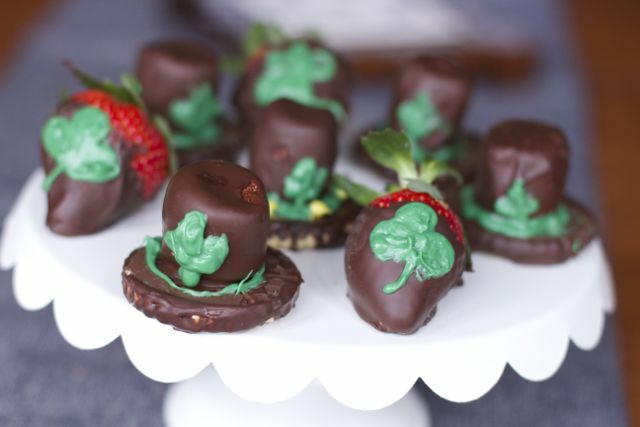 I also got creative with chocolate with these fun St. Patrick’s day treats. Leprechaun hats were inspired by my Pilgrim hats I made 6 years ago. 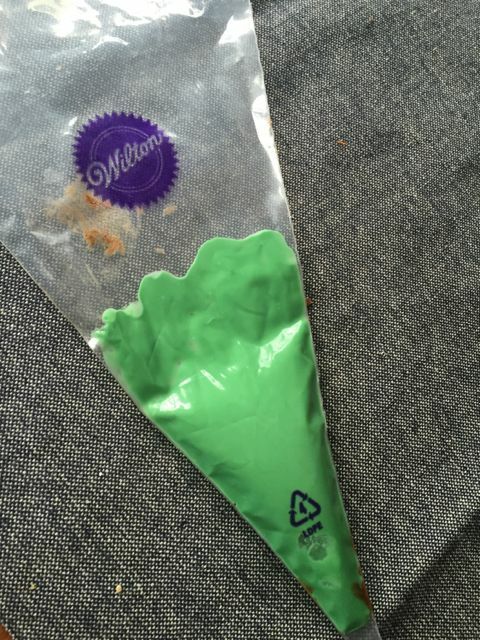 I found that melting chocolate discs in a piping bag is a great way to decorate your chocolate covered treats. I just could not stop just one St. Patrick Day dessert today, these cookies were amazing but I also made some chocolate covered strawberries with clovers. 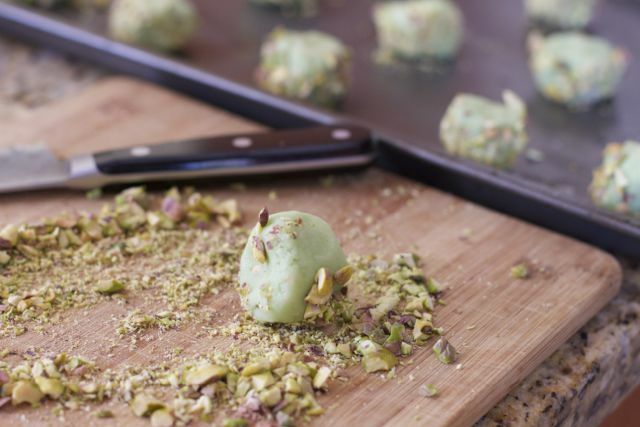 make these pistachio pudding cookies for your St. Patrick's day celebration or for anyone that loves pistachios. Cream butter, sugar, and pudding mix. After the mixture is smooth, add egg and vanilla, and mix until well-incorporated. Add in remaining ingredients and mix until everything is combined. Using an ice cream create small balls of dough and roll them in the nuts. Let cool on cookie sheet for about 3 minutes, and place kisses in center of each cookie while still warm. Transfer to cooling racks and cool completely. What are some of your favorite St. Patrick Day dessert ideas? « Can an Air Mattress be a Comfortable Sleeping Option? I love pudding cookies bc they often have seasonal flavors. Pistachio is year round I believe. I love pistachios so I will have to try this!! Thanks for sharing!! What a great twist on the traditional kiss cookie. Perfect for St. Patrick’s Day. 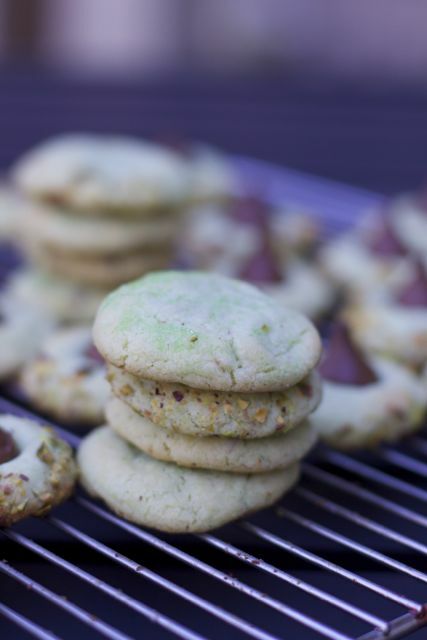 These little green cookies just scream St. Paddy’s Day! They look delicious and are very cute. The kids would love them here. I had no idea pistachio pudding was a thing! These are so cute. 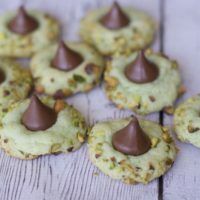 I love kiss cookies, but I’ve never had a pistachio version before. They are totally perfect for St. Patrick’s Day! 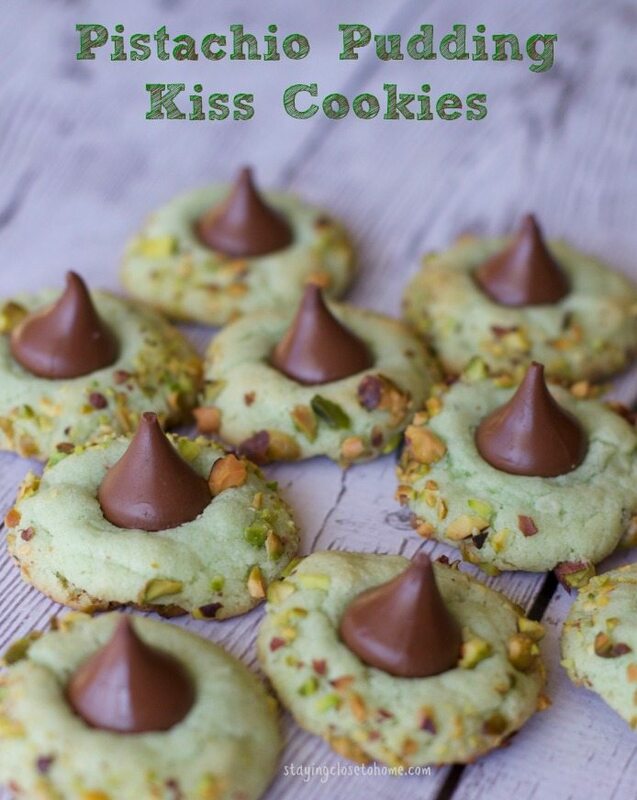 Love these Pistachio Pudding Kiss Cookies! They look so delicious!